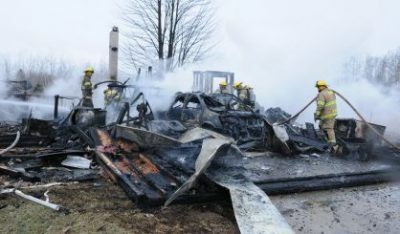 A suspected propane explosion is blamed for leveling a home in Casco Township. South Haven Area Emergency Services says the home in the 6000 block of 104th avenue near 60th Street blew up around 12:30 Sunday afternoon. One woman was in the house at the time and was rushed by SHAES ambulance to the Bronson Burn and Wound Center in Kalamazoo. Her condition has not been released. Firefighters from Clyde, Columbia, Ganges, and Lee townships assisted SHAES with the response.